AutoProfits Machine is course made up of one PDF, and six videos inside a members area. The product promises to teach you how to make money with affiliate marketing by showing you how to avoid common mistakes and implement basic affiliate marketing methods. AutoProfits Machine is full of the same problems that most other products have. It’s boring, lacks support and only offers a basic level of information, which is based on theories and not real-world situations. Products like AutoProfits Machine are a dime a dozen. Once you buy AutoProfits Machine you’re asked to consider a couple other products. Since this is the process Edward is trying to teach, I’m not surprised to see him use it. 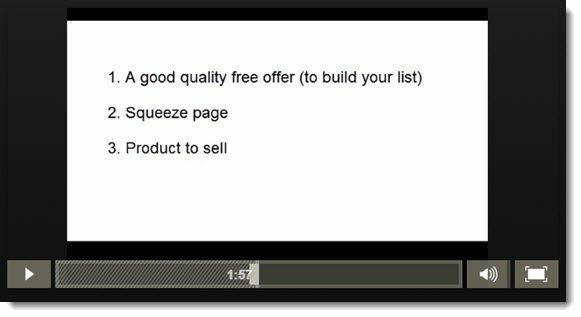 This upsell is a course that promises to teach you how to drive lots of traffic to your website, salespages, or whatever you’re driving traffic to. It's called Extreme Traffic Academy. The course is offered through a members area with a series of videos. You will also get swipe files, case studies and help creating graphics. This one will cost you an additional $97. For that kind of money, it better be extreme. The next upsell is simply an upgrade for the Extreme Traffic Academy offer above. This time, for another $27, you can have Edward and hist staff do everything for you. I somehow doubt that Edward is going to build and run a business for you, for a little more than $100, but it’s he doesn’t make it clear what “do everything for you” means. I wouldn't build a money generating business for someone unless they paid me an hour wage to build it (no income guaranteed) and residual income from earnings. Why? Because why would I build a business for someone else when I could build my own? The sales page is full of your typical salesy, overhyped, vague nonsense, so purchase this one at your own risk. Despite the many things I did not like about AutoProfits Machine, there is one thing that might be valuable to you. There’s not much else I can say for this product, but it will teach you a little bit about sales funnels. That’s really what this course is all about: the principles of a basic sales funnel. I sometimes take for granted that not everyone knows this information, so if you're a total newbie, this info may be an eye opener to you. Edward says that most marketers do not implement basic sales funnels in their business, and that it costs them. I happen to agree with that. I see marketers everyday who are trying to sell something online, yet they don’t use any type of funnel to attract and hold a potential buyer’s attention. Many of them make the mistake of simply sending traffic to an offer and expecting them to buy. That’s not how things work. I’ve read that most people need to be exposed to an offer seven times before they finally make a purchase. That’s why so many marketers fail. It’s not easy to create those seven points of contact for your offer, especially without a sales funnel. If any of the stuff I just mentioned sounds foreign to you, then you might learn something from AutoProfits Machine. It isn’t possible for me to explain how absolutely boring this course was. Not only were the videos terrible (we will discuss this in a minute), but Edward’s voice is monotone throughout each lesson, some of which last twenty-five minutes long. He stammers and stutters through the whole thing, making the course last twice as long as it needs to be. I place some importance on the delivery of information within a given product. It’s not the most important thing, but it does play a role in how well the buyer soaks it all in. That’s one reason I like products that offer videos instead of ebooks, or even audio. Video is a more stimulating medium and the buyer (you and me) benefits from that in a number of ways. So, a video course is something I tend to rank a little better…except in cases like this one. AutoProfits Machine does offer video, but they are not the type of videos that keep you engaged. In fact, they aren’t even presentation-style videos. Instead, they are blank screen-shots of a notepadesque looking slide. Combine that with Edward’s monotone British voice and it’s off to sleepytown. I don’t want to pick on the guy, but if you’re going to provide general information you’ve got to spice-it-up somehow. He could have easily made screen-recordings, where he would have given us an over-the-shoulder view into what he’s trying to teach. That would have made things much easier to follow. And at one point, Edward even mentions the fact that “most people don’t give you a live example”, but he forgets about it, I guess. It’s unfortunate, but Autoprofit Machines doesn’t offer any real support. Personally, I prefer products that offer a members forum, a Facebook group, or some other type of community. That type of support is best for buyers, because it allows them to engage and ask questions in realtime with other members from all different experience levels. The kind of support offered with AutoProfits Machine is the worst kind: a support desk. Support desks can’t help you with real business problems. They are only there to help with things like downloading issues and refunds. If you’re trying to build a business online you are going to need much more than that. To make things worse, AutoProfits Machine support desk only operates during regular business hours. I can’t tell you how many times I’ve needed help in my business outside of those hours. What if you work a 9-5 job, an are building your business in the evenings? Support is what truly makes or breaks a course like this one. Three days for a ticket response on business days? Emailing them on Friday could result in a 5 day wait period for a response. Even if AutoProfits Machine was a good product, this kind of support would be a deal-breaker for me. Beginners need support, and they need it at the oddest times, especially since most new marketers are still working day jobs. The things Edward teaches in this course are all based on theory. His point in making this course is that most affiliate marketers don’t follow the simple basic steps to produce a real profit, and he’s right about that. However, that doesn’t make his advice anymore unique, or needed. Edward basically says that by simply setting up a a landing page, a thank you page and two pages for upsells, that you can make money online. Yes, that is true, but there is a lot more to it than that. Just because you setup all these things doesn’t mean you will start making money. You’ve still got to worry about getting traffic to those pages first and foremost. And traffic is a huge topic all on its own. And even after that, there are no guarantees that you will make any money at all. The build-it-and-they-will-come mentality does not apply online. Some people need a bit of extra help getting their first online business started, and most product creators just aren’t willing to give that extra support. Once a sale is done, it’s done, and you’re on your own. But I offer my continued support and assistance to all members of this online business community. Starter memberships are free, and you can even send me a message to see inside to see if I’m the real deal, or just another internet guru! Their training does not focus on building your own product – but instead affiliate marketing. They talk about how to write content, get traffic to your site, and optimize for sales. There's a lot more going on in the community as well like weekly live webinars, but you can click the link above to find out more.